Ten Reasons to Keep an Art Journal — Hi! I'm Kat Sturges...Loving the Creative Life! Keeping a traditional written journal is important for sure, but keeping an art journal takes the journal process to a whole new level! 1. Working in an art journal gives you freedom to play. You can keep the journal for your eyes only so the works don't have to meet any standards of perfection. I love making imperfect art, and while I've worked for years honing my skills sometimes it is fun to just "let your hair down" so to speak and make more spontaneous art in journals. 2. You can use whatever materials you have on hand. When you work on watercolor or mixed media paper the sky is the limit when it comes to supplies. If you are working on thinner paper, simply glue two pages together and the paper will be able to withstand whatever paint and collage fodder you throw at it. 3. Art journals are a great place to try out new techniques. If there are things you've been wanting to learn, practice them in your journal to hone your skills. 4. Visual art is an amazing way to process your life. Sometimes I find that when I write longhand I sometimes ruminate or overthink what is going on in my life. Visual journaling is a super cool way to express things you are thinking, feeling and experiencing without getting so stuck in your thoughts. 5. If you have been wanting to create meaningful art, your art journal is a perfect place to do just that. Journal about the things you care about and your visual journal will become a place that you long to visit each day. 6. 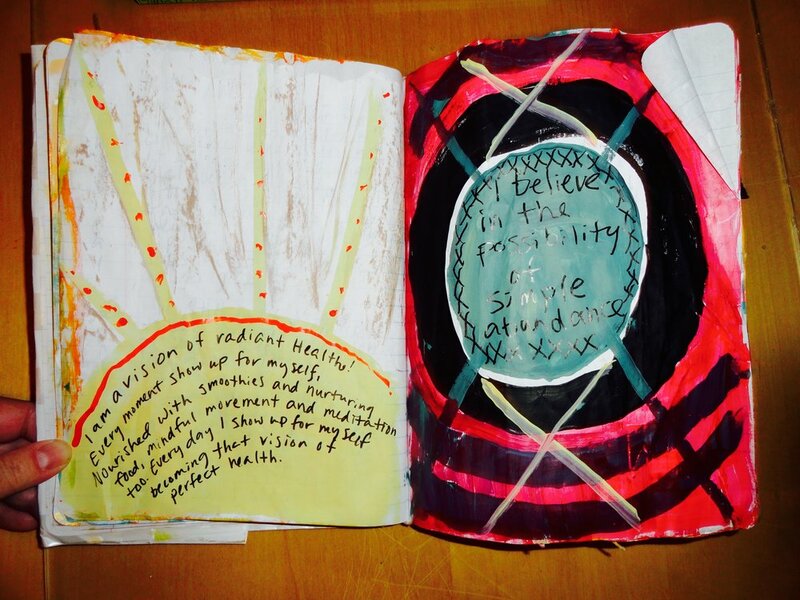 Art journals are a great place to process emotion. If you are the intellectual type, visual journaling gives you a chance to work with your hands and express your feelings in a comfortable way. 7. You can vent in your journals. If you have a bad day there is no better way to get it out of your system than to create a journal page about it. 8. Art journaling gives you so much freedom to make art about things that really matter to you. Sometimes while creating finished pieces I find myself editing the content because other people will see it. My art journals are totally different! I keep most of the pages private so the art is about topics that are more personal. 9. Journals become like time capsules. After a couple of years you can flip through old journals and remember so much more about your life. I've kept both written journals and art journals. I almost never go back through my written journals however the art journals feel really special to me. I love looking back over journals from the past. They help me to see my life from a more sweeping view. 10. Keeping an art journal helps you make art every single day. You can even just glue in a bit of collage or draw, make lists and paint them, jot down notes. Just try to show up at your journal a little bit each day and in time you will have a beautiful book which can bear witness to your life. I'm smitten with art journaling and I hope you will give it a try too! This year the blog is focusing more on keeping an art journal so I will give you lots of ideas and techniques to play with. Life is art!